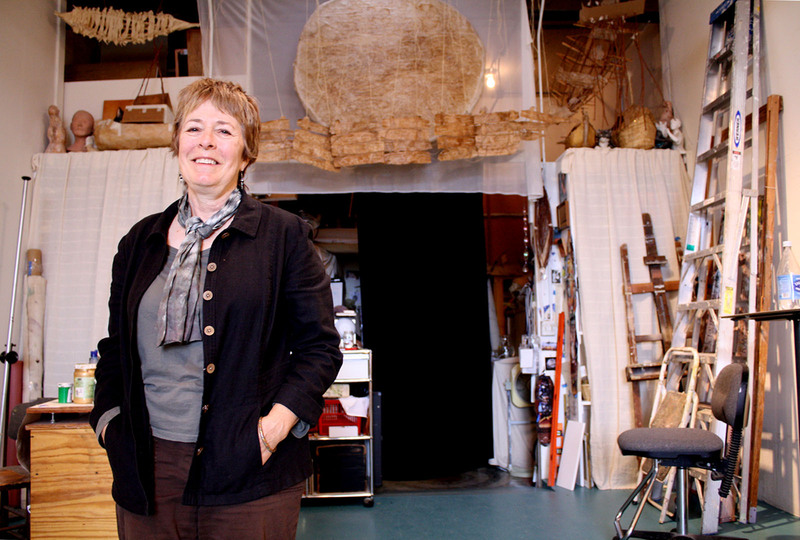 Jennifer Ewing in her studio at Developing Environments. Developing Environments, one of San Francisco’s oldest artist live-work spaces, is celebrating its 40th anniversary this weekend. Behind its unassuming entrance at 540 Alabama St. are raw cement common rooms and the manicured living spaces of the 35 artists housed in the former fruit canning factory. Despite rising rents that have driven many individuals and arts groups to the comparatively cheap East Bay, Developing Environments has stayed vibrant like few others. “Because it is affordable housing for artists, it has totally freed me up to focus on what I do,” said Danielle Cohen. Cohen produces fashion and art events and her husband, Roland, does fine woodworking. The couple moved to Developing Environments from Million Fishes, another live-work space and art gallery in the Mission. “As of this month, Million Fishes has disbanded,” Cohen said, noting that the group was evicted after its landlord decided to rent or sell the space for considerably more than the artists were paying. Developing Environments has been more fortunate. While the group’s members credit its longevity to many things — getting young people to move in, support from the city, a shared vision — their landlord is most often cited as the reason Developing Environments still exists. 540 Alabama is owned by Peter Royce, whose father, Ken, supported the artists when they moved into the building in the 1970s. The artists said that the family has shied away from the spotlight but has continued to support Developing Environments for four decades. “The landlord did give us $200,000 in loans and originally gave us money when the building was actually condemned, to bring it up to code,” said Hugh Buck, who moved in in 1974. At the time the building had no interior walls, the windows were bricked over and there was little water or electricity. In the early days, active train lines passed in front of the building, and the neighbors were a cement factory and a nearby Best Foods mayonnaise plant, where Coffee Bar now operates. Developing Environments celebrates its 40th anniversary with a special open studios Oct. 27 and 28, 11 a.m.-6 p.m. Correction: the building’s original purpose was for cold storage, not a canning factory. Project Artaud nearby was a canning factory.